Methocel K100 LV, methocel E15 LV, colloidal silicon dioxide 200, microcrystalline cellulose ph 102, magnesium stearate. The daily dose may vary from 1 to 4 tablets per day, i.e. from 30-120 mg taken orally in a single intake at breakfast time. It is recommended that the tablet(s) be swallowed whole. The Recommended Starting Dose is: 30 mg daily. If blood glucose is not adequately controlled, the dose may be increased to 60, 90 or 120 mg daily, in successive steps. The interval between each dose increment should be at least 1 month except in patients whose blood glucose has not been reduced after two weeks of treatment. In such cases, the dose may be increased at the end of the second week of treatment. 1 tablet of Glicla 80 mg Tablets is comparable to 1 tablet of Glicla MR 30 mg Tablets. Consequently the switch can be performed provided a careful blood monitoring is done. Glicla MR Tablets can be used to replace other oral antidiabetic agents. 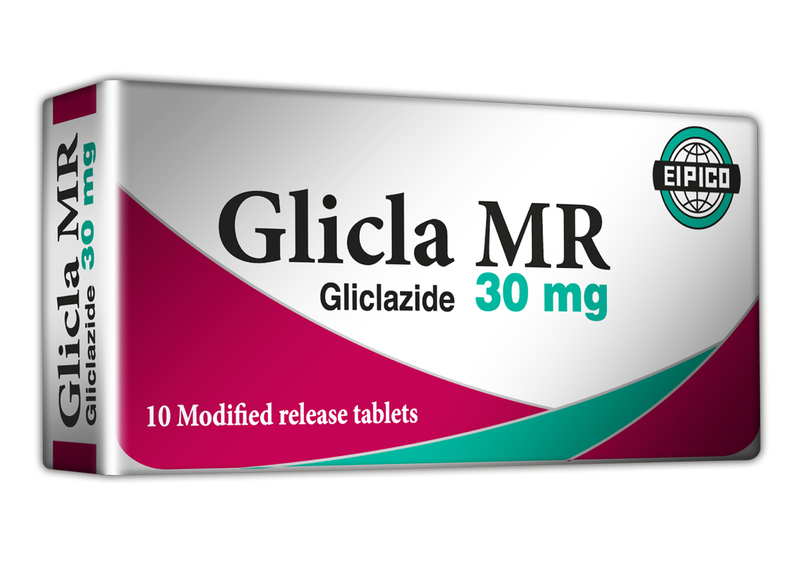 The dosage and the half-life of the previous antidiabetic agent should be taken into account when switching to Glicla MR Tablets. A transitional period is not generally necessary. A starting dose of 30 mg should be used and this should be adjusted to suit the patient's blood glucose response, as described above. When switching from a hypoglycaemic sulphonylurea with a prolonged half-life, a treatment free period of a few days may be necessary to avoid an additive effect of the two products, which might cause hypoglycaemia. The procedure described for initiating treatment should also be used when switching to treatment with Glicla MR Tablets, i.e. a starting dose of 30 mg/day, followed by a stepwise increase in dose, depending on the metabolic response. Glicla MR Tablets can be given in combination with biguanides, alpha glucosidase inhibitors or insulin. In patients not adequately controlled with Glicla MR Tablets, concomitant insulin therapy can be initiated under close medical supervision. Glicla MR should be prescribed using the same dosing regimen recommended for patients under 65 years of age. In patients with mild to moderate renal insufficiency, the same dosing regimen can be used as in patients with normal renal function, with careful patient monitoring. These data have been confirmed in clinical trials. The safety and efficacy of Glicla MR Tablets in children and adolescents have not been established. No data is available. Hypersensitivity to gliclazide or to any of the excipients, other sulphonylureas, or sulphonamides. Severe renal or hepatic insufficiency; in these cases the use of insulin is recommended. Hypoglycaemia may occur following administration of sulphonylureas. Some cases may be severe and prolonged. Hospitalisation may be necessary and glucose administration may need to be continued for several days. Patient refuses or (particularly in elderly subjects) is unable to co-operate. Malnutrition, irregular mealtimes, skipping meals, periods of fasting or dietary changes. Imbalance between physical exercise and carbohydrate intake. Overdose of Glicla MR Tablets. Certain endocrine disorders: thyroid disorders, hypopituitarism and adrenal insufficiency. Concomitant administration of certain other medicines. The risks of hypoglycaemia, together with its symptoms, treatment, and conditions that predispose to its development, should be explained to the patient and to family members. The patient should be informed of the importance of following dietary advice, of taking regular exercise, and of regular monitoring of blood glucose levels. Treatment of patients with G6PD-deficiency with sulphonylurea agents can lead to haemolytic anaemia. Since gliclazide belongs to the chemical class of sulphonylurea drugs, caution should be used in patients with G6PD-deficiency and a non-sulphonylurea alternative should be considered. Alcohol: increases the hypoglycaemic reaction (by inhibiting compensatory reactions) that can lead to the onset of hypoglycaemic coma. Avoid alcohol or medicines containing alcohol. Other anti-diabetic agents (insulins, acarbose, metformin, thiazolidinediones, dipeptidyl peptidase-4 inhibitors, GLP-1 receptor agonists), beta-blockers, fluconazole, angiotensin converting enzyme inhibitors (captopril, enalapril), H2-receptor antagonists, MAOIs, sulphonamides, clarithromycin and non-steroidal anti-inflammatory agents. Chlorpromazine (neuroleptic agent): high doses (> 100 mg per day of chlorpromazine) increase blood glucose levels (reduced insulin release). Warn the patient and emphasise the importance of blood glucose monitoring. It may be necessary to adjust the dose of the antidiabetic active substance during and after treatment with the neuroleptic agent. Sulphonylureas may lead to potentiation of anticoagulation during concurrent treatment. There is no experience with the use of gliclazide during pregnancy in humans, even though there are few data with other sulphonylureas. Oral hypoglycaemic agents are not suitable; insulin is the drug of first choice for treatment of diabetes during pregnancy. It is recommended that oral hypoglycaemic therapy is changed to insulin before a pregnancy is attempted, or as soon as pregnancy is discovered. Glicla MR Tablets has no known influence on the ability to drive and to use machines. However, patients should be made aware of the symptoms of hypoglycaemia and should be careful if driving or operating machinery, especially at the beginning of treatment. Based on the experience with gliclazide, the following undesirable effects have been reported. As for other sulphonylureas, treatment with Glicla MR can cause hypoglycaemia, if mealtimes are irregular and, in particular, if meals are skipped. Possible symptoms of hypoglycaemia are: headache, intense hunger, nausea, vomiting, lassitude, sleep disorders, agitation, aggression, poor concentration, reduced awareness and slowed reactions, depression, confusion, visual and speech disorders, aphasia, tremor, paresis, sensory disorders, dizziness, feeling of powerlessness, loss of self-control, delirium, convulsions, shallow respiration, bradycardia, drowsiness and loss of consciousness, possibly resulting in coma and lethal outcome. Gastrointestinal disturbances: abdominal pain, nausea, vomiting, dyspepsia, diarrhoea, and constipation have been reported: if these should occur they can be avoided or minimised if gliclazide is taken with breakfast. Skin and subcutaneous tissue disorders: rash, pruritus, urticaria, angioedema, erythema, maculopapular rashes, bullous reactions (such as Stevens-Johnson syndrome and toxic epidermal necrolysis). Hepato-biliary disorders: raised hepatic enzyme levels (AST, ALT, alkaline phosphatase), hepatitis (isolated reports). Discontinue treatment if cholestatic jaundice appears. These symptoms usually disappear after discontinuation of treatment. As for other sulphonylureas, the following adverse events have been observed: cases of erythrocytopenia, agranulocytosis, haemolytic anaemia, pancytopenia, allergic vasculitis, hyponatremia, elevated liver enzyme levels and even impairment of liver function (e.g. with cholestasis and jaundice) and hepatitis which regressed after withdrawal of the sulphonylurea or led to life-threatening liver failure in isolated cases. Pharmacotherapeutic group: sulphonamides, urea derivative. Plasma protein binding is approximately 95%. The volume of distribution is around 30 litres. A single daily intake of Glicla MR maintains effective gliclazide plasma concentrations over 24 hours. Glicla MR 30 mg Tablets: Box containing 3 strips of 10 tablets each.